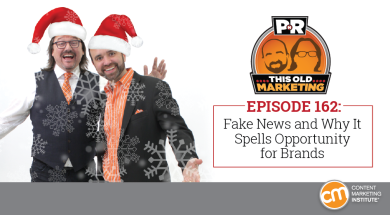 In this holiday edition, Robert and I explore Facebook’s new process for dealing with fake news – and the opportunities it may present for content-driven brands. In other news, we discuss why your body of work matters, why some research is really bad, and how sponsored content can pay off for a business. Our rants and raves feature David Copperfield and a new Altimeter report; we close the show with an example of the week from OpenView Venture Partners. Facebook details a user-policing plan to combat fake news (09:20): NPR brings us news that Facebook is working with fact-checking groups to identify bogus stories and to warn users if a story they are trying to share has been reported as fake. While the jury is still out as to whether Facebook’s plans for democratizing trust is the best way to approach the information integrity problem, Robert believes it might have the unintended side effect of making it more difficult for brands to build the business case for content. Why the laws of supply and demand don’t work online (20:05): An article posted on The Media Briefing website argues against the idea of restricting ad inventory in order to increase its value as a commodity. Asserting that the traditional supply-and-demand model was not built for a world where impressions can be generated with the flick of a switch, the article offers up the benefits of “data-inspired branded content” as a more viable solution. In our eyes, the author is on the brink of realizing that content marketing is that logical solution marketers are looking for, but he is falling just short of connecting to the aha moment. The current state of the content marketing ecosystem (30:27): Search Engine Journal has shared a new CopyPress infographic depicting some of the biggest trends, views, and beliefs currently driving our industry. The “stat soup” of data presented in the graphic – which is based on a survey of 300 in-house marketers, agencies, and freelance creatives – seems impressive; yet we are both skeptical of some of the findings, and are also troubled by the article’s inclusion of an additional data point Robert and I have contested in the past: that content marketing is 62% cheaper than traditional marketing. Publishers take on ad-agency roles with branded content (36:36): A recent article in The Wall Street Journal explores the growing trend of publishers expanding into areas that traditionally have been the domain of ad agencies – such as producing sponsored content and conducting research for companies – as a means of solidifying their revenue and lessening their reliance on advertising. Robert and I feel the article is a good overview of where the publishing industry is at right now; and while we are pleased to see publishers recognize the need to diversify, we fear this particular path is eventually going to lead them to the same dead end as ad-based models did. Content Marketing Institute’s 2017 Events. Whether you are just getting started with content marketing or are looking to take your expertise to the next level, CMI’s portfolio of events has you covered. From our free virtual ContentTECH conference to Content Marketing World – the largest annual gathering of content marketing professionals in the industry – we offer a wide range of unparalleled training, education, and networking experiences. Check out all the events we have in store for 2017, including our strategy-focused Intelligent Content Conference, and use the code PNR100 for a special discount on registration. Joe’s rave No. 1: The Washington Post has unveiled a web browser extension (for Google Chrome and Firefox) that inserts some factual context into claims like the ones Donald Trump has been making on Twitter. I love the idea that someone will be fact-checking tweets, and I’m looking forward to seeing more efforts like this emerge on social media in the days ahead. Joe’s rave No. 2: On a recent trip to Las Vegas, I was able to take my wife to see one of her favorite performers: magician David Copperfield. One of the coolest parts of the show, for me, was when David asked the audience to email their city, state, and country to him. The results were then displayed on a giant digital map of the world, giving us all a real-time view of where everyone in the audience was from. My takeaway: Even in the social media era, there’s still a lot of magic to be found in the power of email. Robert’s commentary No. 1: After making a prediction last week about agencies acquiring media companies for the purpose of programmatically targeting consumers across multiple platforms, Robert decided to do a bit more digging on the topic. Sure enough, he discovered that some of the larger agencies are making moves in this direction by acquiring e-commerce companies. If you are interested in exploring this trend in more detail, he suggests starting with the news of WPP’s acquisition of Triad Retail Media. Joe’s commentary No. 2: A new report from our friends at analyst firm Altimeter (registration required) offers up a maturity model for digital content. While the advice the report provides is solid – if a little bland – Robert refutes the conclusions drawn in the research about how much progress is actually being made toward maturity. He reminds us that just because people believe in the value of a good content strategy doesn’t mean they are actually putting one in place in their organizations. Kudos to our friends at venture capital firm OpenView Venture Partners. Previously, we’ve talked about the company’s venture capital learning platform, OpenView Labs, and the excellent job it does of helping software start-ups build and grow their businesses. 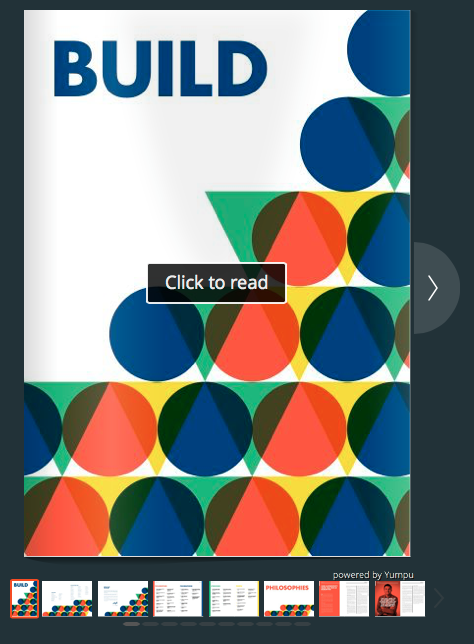 One of the Lab’s current content marketing initiatives is Build: a beautifully designed and highly detailed digital magazine/report that shares the experiences of successful builders and makers – including their ups, their downs, and the lessons they learned while working in the trenches. Everything published in Build is purely educational and devoid of branding, save for a small introduction from OpenView’s founder Scott Maxwell. And though much of the information was culled from posts that previously published on the OpenView blog, the material has been curated and enhanced in such a way that it’s become a truly special example of This Old Marketing.